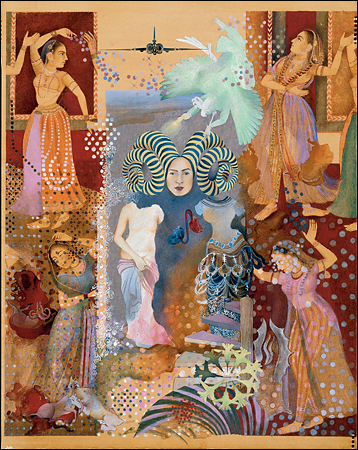 "Pleasure Pillars" (2001) by Pakistani-born Shahzia Sikander. What Does Islam Look Like? THE West and Islam are on a cultural collision course. That's the best-selling fiction that many people — politicians, religious leaders and the media on both sides of the equation — are working overtime to turn into fact. Actually, it's a very old story, and art is routinely pulled into it. Always, we hear Islamic art talked about in the way something called the "Islamic world" is talked about, as if it were unitary, unchanging, inscrutable and over there. We hear that Islamic art is, by definition, religious art, and we hear about its hostile relationship to the human image. We got an earful of this with the furor over Danish cartoons lampooning the Prophet Muhammad. The fact is, images of the Prophet abound in Islamic art and culture; the Metropolitan Museum has several examples in its Islamic collection. But unlike the cartoons, such images are not caricatures. The cartoon issue isn't primarily an art story, any more than the destruction of the mosque at Ayodhya in India was an architecture story, or the censure of "The Satanic Verses" was a story about contemporary fiction. It's a political story, an ancient and universal one, about how an image, and almost any image will do, once it is fused to cultural identity — Islam, in this case — can end up being used as a weapon. As it happens, at the same time that intense partisan heat is being generated around the topic of popular images and Islam, we are getting a number of exhibitions of contemporary work to which the name "Islamic" is attached. Some shows approach the Islamic connection hesitantly; others embrace it. Together they tell us very different things about the reception of a cultural category called "Islam" in the West. By far the most prominent exhibition of contemporary art on the subject yet seen in New York opens today at the Museum of Modern Art. You would never guess that subject, though, from its title — "Without Boundary: Seventeen Ways of Looking" — in which the word Islam does not appear. All but three of the featured artists were born in some part of the so-called Islamic world: Algeria, Egypt, India, Iran, Iraq, Lebanon, Pakistan, Palestine and Turkey. But they all live and work in the West and have made their careers in the mainstream international art scene, which means in Europe and the United States. Despite their Western positioning, they are routinely tagged as Islamic artists by an art world addicted to marketable categories. The question posed by the show's curator, Fereshteh Daftari, an assistant curator at the Modern who was herself born in Iran, is "How 'Islamic' is their art?" Most of these artists are tagged Islamic because of their backgrounds. Yet much of their work is far less about Islam itself, as a religion or culture, than about their relationship to Islam — in some cases it is close and positive; in other cases, distant and critical. But in most instances, it is ambivalent — the opposite of how Islam is treated these days in the larger world.